1982: Records with jazz-funk band Material on the album One Down. She will record a song for an album featuring the Weather Girls next year. January 1983: Clive Davis, founder of Arista Records, is introduced to Houston by Arista R&B executive Gerry Griffith and signs her to a worldwide contract. Davis will spend the next year and a half shaping Houston for stardom and working on her debut album. March 1985: That debut album, Whitney Houston, is released in the US. Initially, sales are slow. July 1985: Houston's debut single, "You Give Good Love," finally reaches US#3. It rouses little interest in the UK, where it fails to chart. January 1986: "Saving All My Love" garners Houston trophies in the Favorite Single (Soul/R&B) and Favorite Video Single (Soul/R&B) at the 13th Annual American Music Awards. She will win Best Pop Vocal Performance, Female at the Grammy Awards next month. February 1986: Produced by Narada Michael Walden, "How Will I Know" tops the US Hot 100 and R&B charts. It will climb to the #5 spot in the UK. March 1986: Whitney Houston reaches #1 on the US album chart, and will go multi-platinum. May 1986: Houston's cover of the 1977 George Benson hit "The Greatest Love Of All" becomes her third #1 hit in the US, and climbs to UK#8. Whitney becomes the first solo female artist to ever have three #1 hits from one LP. September 1986: Houston wins Best Female Video for "How Will I Know" at the 3rd Annual MTV Awards. November 1986: Following a successful American tour, Houston begins a sell-out European tour. January 1987: At the 14th Annual American Music Awards, Houston wins Favorite Female Artist (Soul/R&B), Favorite Video Single (Soul/R&B), Favorite Female Artist (Pop/Rock) and Favorite Album (Pop/Rock). June 1987: Houston's second album, Whitney, is released, entering the UK album chart at #1. In the US it becomes the first album by a female singer to debut at the #1 spot, and will remain there for eleven weeks. The first single, "I Wanna Dance With Somebody," tops both the US and UK singles charts. July 1987: Arista signs a deal withTri-Star Pictures to find a film vehicle for Houston. September 1987: The ballad "Didn't We Almost Have It All" becomes Houston's fifth consecutive #1 single in the US, while peaking at UK#14. A world tour is announced. January 1988: "So Emotional" hits #1 in the US, Houston's sixth chart-topper in a row. A few weeks earlier it had reached UK#5. Houston wins Favorite Female Artist (Pop/Rock) and Favorite Single (Pop/Rock) at the 15th Annual American Music Awards. March 1988: Houston wins Best Pop Vocal Performance, Female for "I Wanna Dance With Somebody" at the 30th Annual Grammy Awards. Later this month, she wins Album of the Year, Female at the 2nd Annual Soul Train Awards. April 1988: Houston sets a record with seven consecutive US chart-toppers when "Where Do Broken Hearts Go" reaches #1 -- the previous record-holders had been the Beatles and the Bee Gees, both with six. June 1988: The fifth single from Whitney, "Love Will Save The Day" soars to UK#10. While on a sell-out world tour, Houston headlines Nelson Mandela's 70th Birthday Tribute at Wembley Stadium, London. August 1988: "Love Will Save The Day" stalls at US#9. October 1988: "One Moment In Time," a ballad from an Olympics musical tribute album of the same name, tops the UK chart for two weeks. In November it will reach US#5. January 1989: At the 16th Annual American Music Awards, Houston wins Favorite Female Artist in both the Soul/R&B and Pop/Rock categories. Oct 1990: 'I'm Your Baby Tonight' is released as the first single from her third album. It charts at UK #5 and returns her to the top of the US chart. Dec 1990: The album 'I'm Your Baby Tonight' makes US #3 and UK #4. NME gives it 0/10. "Whitney sings better than ever. But so what? The songs are blander than Terry Wogan," the paper says. Jan 1991: Houston receives an award for distinguished achievement from the American Cinema Award Foundation - despite the fact that she has not yet appeared on the screen. Jan 1991: At the height of the Gulf War, Houston sings 'The Star Spangled Banner' at the American Superbowl in Miami. The performance is released as a single and reaches US #20, with proceeds going to charity. She will sing it again several months later at a televised "Welcome Home Heroes" concert for US military personnel returning from the Gulf War. Feb 1991: 'All The Man That I Need', a cover of a Sister Sledge hit, is released as a single and goes to US #1. May 1991: 'Miracle' is released as a single and charts at US #9. Jul 1991: 'My Name Is Not Susan' is released as a single and charts at UK#29 and US #20. Sep 1991: Houston, having cancelled much of a US tour in the summer due to throat problems, recovers to sing ten nights at Wembley Arena. She also speaks at an AIDS rally in London's Hyde Park. Dec 1991: At the Billboard Awards, Houston wins Top album, Top Artist and Top Singles artist in the R&B category. Jul 1992: Houston marries Bobby Brown, and Stevie Wonder performs at the wedding. Nov 1992: Houston's first film, 'The Bodyguard', opens. 'I Will Always Love You', taken from the soundtrack and written by Dolly Parton, goes to US #1 and UK #1 and becomes one of the biggest-selling singles of all time. The soundtrack album, which also features other artists, tops the charts in the US and the UK and many other countries around the world. Feb 1993: 'I'm Every Woman', a cover of Chaka Khan's hit, is released as a single. Despite the fact that 'I Will Always Love You' is still at #1 in the US, it goes to US #4. Mar 1993: Houston gives birth to a daughter, Bobbi Kristina Houston Brown. Apr 1993: 'I Have Nothing' is released as a single and charts at US #4 and UK #3. Jul 1993: 'Run To You' is released as a single and charts at US #31 and UK #15. Oct 1993: 'Queen Of The Night' is released as a single and charts at UK #14. Oct 1993: 'Something In Common', a duet with Bobby Brown, is released as a single. "An absurdly bad record," NME says. Feb 1994: The awards for 'The Bodyguard' start with victory in eight categories at the American Music Awards. Feb 1994: 'The Bodyguard' wins Best Soundtrack at the BRIT awards. Mar 1994: Houston wins three more awards at the Grammies. Mar 1994: She wins Song Of The Year at the Soul Train Music Awards. May 1994: Houston is named Best-Selling Pop Artist Of The Year and wins four other awards at the World Music Awards in Monte Carlo. Jul 1994: Houston sings at the World Cup Final between Brazil and Italy in Pasadena . She spends most of the rest of the year on a mammoth US tour and ends 1994 with A Concert For A New South Africa in Johannesburg. Sep 1995: It is announced that Houston and Brown, her husband of three years, have separated. They will reconcile two months later. Nov 1995: 'Exhale (Shoop Shoop)' is released as a single from the soundtrack of her forthcoming film, 'Waiting To Exhale'. It charts at UK #11 and US #1. The soundtrack album also tops the US chart. Feb 1996: 'Count On Me', a duet with CeCe Winans, from the film soundtrack, is released as a single and charts at UK #12. It reaches US #8 after Houston and Winans have performed the song at the Grammy awards. Mar 1996: She wins Best Soul Single for 'Exhale (Shoop Shoop)' at the Soul Train Music Awards. Aug 1996: 'Why Does It Hurt So Bad?' is released as a single and charts at US #26. Dec 1996: 'The Preacher's Wife', another film soundtrack featuring Houston, is released and charts at US #3 and UK #35. Jan 1997: At the American Music Awards yet again, Houston wins Favourite Female Artist (Adult Contemporary). Feb 1997: She performs a medley from 'Waiting To Exhale' at the Grammy awards, alongside Aretha Franklin, Mary J Blige, Brandy and others. Mar 1997: 'Step By Step' is released as a single and charts at US #15. Mar 1997: The UK single 'I Believe In You And Me' charts at #16. NME thinks she has taken a lifelong vow "never to make a heartfelt, honest or indeed remotely charismatic record". Nov 1997: American TV airs 'Cinderella', staring Houston as the fairy godmother to Cinderella, played by Brandy. Feb 1998: Houston is honoured for Outstanding Career Achievement at the Soul Train Music Awards. Nov 1998: Her new album, 'My Love Is Your Love', is released. With help from the likes of Lauryn Hill and Missy Elliott, it represents something of a rebirth with its modern urban grooves. It is also her first album since 1990's 'I'm Your Baby Tonight' not to be a film soundtrack. The album returns her to the UK Top Ten and in the US reaches #13 and sells three million copies. Nov 1998: 'When You Believe', a duet with Mariah Carey from the animation film 'The Princess Of Egypt', is released as a single and reaches UK #4 and US #15. Feb 1999: Houston appears at the BRIT awards to sing 'It's Not Right But It's Okay'. Feb 1999: 'It's Not Right But It's Okay', produced by Rodney Jerkins, is released as a single. NME likes it and says: "You're not going to believe this, but Whitney released a decent album late last year." Mar 1999: Houston, Faith Evans and Kelly Price sing together on the single 'Heartbreak Hotel'. Mar 1999: Houston and Carey sing 'When You Believe' at the Academy Awards. Apr 1999: Houston is part of the VH1 Divas Live concert, with Tina Turner, Cher, Brandy and Mary J Blige. Jun 1999: Houston begins a 15-date US tour. Jun 1999: 'My Love Is Your Love', written by Wyclef Jean, is released as a single. "On the strong side," NME admits. Sep 1999: She begins a series of four UK dates, her first in Britain for six years. Jan 2000: Houston is arrested in Hawaii with 15.2 grams of cannabis. Rumours of drug abuse will persist throughout the year, fuelled by reports of her forgetting the words to some of her biggest hits in concert. Her troubles also reportedly lead to her being dropped from a scheduled appearance at the Academy Awards in March. May 2000: 'The Greatest Hits' album is released, containing 36 tracks, including new duets with George Michael and Deborah Cox. It reaches US #5 and sells over two million copies. Sep 2000: 'Could I Have This Kiss Forever? ', a duet with Enrique Iglesias from the 'Greatest Hits' collection, is released as a single. "Urgh," NME shudders. Jan 2001: Whitney is nominated for an American Music Award as Favorite Soul/R&B Female Artist, and for a Blockbuster Entertainment Award as Favorite Female Artist - R&B. Feb 2001: Whitney receives a Soul Train Music Award nomination in the "Best R&B/Soul Single, Group, Band or Duo" category, for 'Same Script, Different Cast', her duet with Deborah Cox. Mar 2001: A judge dismisses the marijuana possession charges against Whitney in Hawaii. Jun 2001: Whitney is honored with the Lifetime Achievement Award at the Black Entertainment Television Awards. 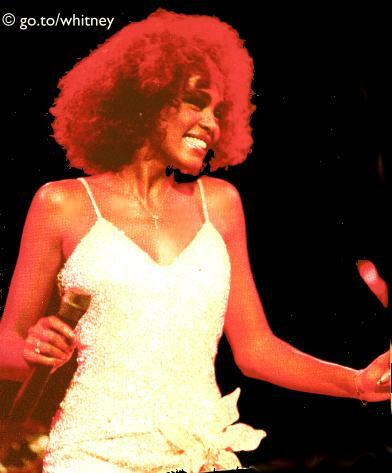 Aug 2001: Whitney signs a multi-album record deal with Arista Records worth over $100 million. In a statement, Whitney says of the deal: "I am so excited with this new deal and I'm looking forward to going into the studio soon to start work on my next album." Sep 2001: Whitney sings at a Michael Jackson Tribute Concert celebrating his 30 years in the music business as a solo artist. Oct 2001: The "Star Spangled Banner" single is certified platinum and tops the US Sales Singles chart. Nov 2001: 'Love, Whitney', a collection of the the diva's greatest love songs, is released. May 2002: Arista Records confirms a planned release date of 6 August 2002 for Whitney Houston's new album.